subsisting on sips of tomato soup and medicated losenges. 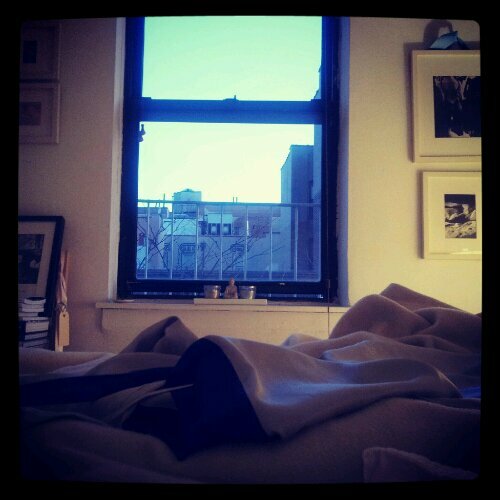 – teamgloria, inc.
subsisting on sips of tomato soup and medicated losenges. Posted on January 10, 2013 January 10, 2013 by teamgloria in places., things. Tis no fun; this illness existence. This compression chamber of gloom. Admittedly a glamorous one, thank the god(s) and our exquisite eye for decoration and light. We had so many Plans for our last few days of manhattan-dwelling. Breakfasts, lunches, movies, tea in 5 star hotels; all final moments with friends (the friends that don’t work in entertainment and thus will Never set foot in los angeles). Instead we lie here, languishing. (thanks to Jonathan who left a care package at our door and a text message to let us know to emerge from this room and retrieve it with much gratitude and emotion. Nice moment: we said tomato soup please, expecting the tins/cans that So Inspired Mr. WARHOL and instead received a Delicious new experience of roasted tomato and basil from wholefoods. #yum). The Very worst bit (apart from slinking out of Town having not said Proper goodbyes) is that we Cannot READ. Ok. Not torture but highly annoying. We got horrid cabin fever by 9pm last night so decided to pull on a thick coat and emerge under the protective cover of darkness. Made it half a block and had to hold onto a lamppost for a while and rest. And yet we’d never been so happy to sniff the late night manhattan air of gasoline, hope, dreams, ambition, something slightly burned or caramelized from the restaurants nearby and exhaust fuel. After 7 mins we hastened back inside and collapsed into a deep sleep punctuated at regular intervals by some gremlin appearing to try and break free from inside our chest in a non-Alien imagery recalling way (or maybe that’s how it felt after hours Hours Hours of it). to our new friends from Uganda! 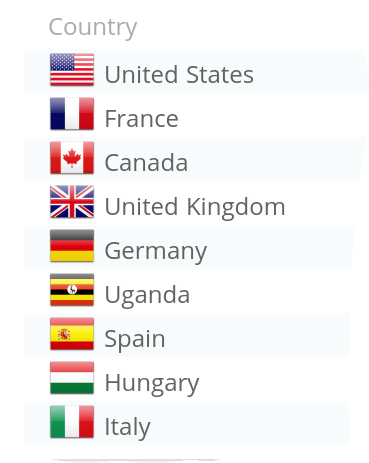 These were our virtual but oh-so-welcomed Visitors yesterday (we are Totally obsessed by the “stats”tab on the wordpress “dashboard”). You are the Nicest sick bed visitors. We don’t worry that you will somehow catch this lurgy and we don’t have to retrieve our looks from their wan-and-shockingly-unbrushed-hair-no-mascara state. *hello, darlings (just in case you didn’t get to study swahilli at university of the Sorbonne). Previous Post grippe. Flu. Misery. How we long for collective denial. Dear tg, it concerns me that it would appear by your photo that nothing has been packed. Now, I know that you are sick and you are not the one who is handling that but aren’t the movers coming soon? An ancient Persian with links to Paris we are sure…….how glorious! When we last moved (upper west side to soho) Jonathan (personal concierge to the Type As) came round, photographed our closets, brought boxes and lots of tape. We went to the office, with a lovely overnight bag and checked into hotel elysee. The next night we went to soho and everything was there. Unpacked. So we leave Saturday on a flight to palm springs. And at some point everything arrives in LA. We are Just too Sentimental to pack. that brought it back (to london university and no mistake and the boys with black eyeliner and backcombed hair). yes. feeling better. staying indoors. just in case. still a bit wobbly. fully intend to be on that PLANE tomorrow morning!! Good girl. I know you will make it. When in doubt about the weight of your carry on…well, you know how to do it, just put it at your feet during check in and then throw it over your shoulder at the last moment after as if it didn’t weigh a ton. Walk away bravely. This you can do. And then you will find you way to the gate, with stops when need be and then sleep on the plane all the way to your next chapter, brave one. You have no idea how Much you have helped us walk through this ending-and-beginning.